In what was once a fine dining restaurant at the Sacramento Valley Station that has been closed to the public for decades, 100 gathered to celebrate the start of a journey to a new and improved historic depot. The project should be completed in the fall of 2016, the 90th anniversary of the train station and the opening of the downtown Entertainment and Sports Center. Greg Taylor, project manager, interviewed by the media. Councilmember Jay Schenirer gives some light hearted comments to the group at the event. Federal Railroad Administrator Joseph C. Szabo speaks to the crowd. A complete renovation is getting started on the second phase of the region’s highest priority transportation project – a world-class transit hub – and anchor to the downtown Railyards. When finished, the 68,000-square-foot building will include new Amtrak offices, leasable office and retail space and food vendors. The building and adjacent property was purchased by the City from Union Pacific Railroad in 2006. It’s the seventh busiest train station in the U.S. 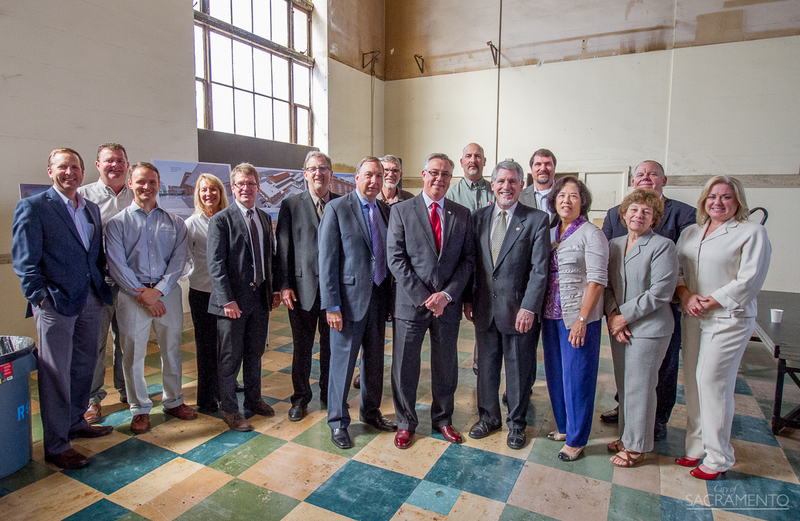 The program included Federal Railroad Administrator Joseph C. Szabo, Sacramento Rep. Doris Matsui, Vice Mayor Jay Schenirer, Councilmember Steve Cohn, City Manager John Shirey and Director of Public Works Jerry Way along with invited project sponsors, partners and team members. Congresswoman Doris Matsui interview by the media. Councilmember Steve Cohn speaks on how long the station has been around. “Sacramento Valley Station is anchored by the Capitol Corridor, the fastest growing intercity rail service in the nation. Together with San Joaquin and long distance Amtrak trains, over 1.2 million passengers use our downtown station each year. And the numbers will grow as we offer express trains to San Francisco, light rail to the Airport and Elk Grove, and a streetcar,” said Councilman Steve Cohn. City Manager John Shirey, serving as MC to the event. Fran Halbakken, Railyards Manager, and Hinda Chandler, lead architect stand for recognition. Jerry Way, Director of Public Works thanks the many that work hard on the project. Previous PostWhat’s your favorite part of Fall in Sacramento?